DAVID W. ROUBIK1, Ph. D.
Presentado 1 de noviembre de 2008, aceptado 1 de febrero de 2009, correcciones 7 de julio de 2009. Very little effort has been made to investigate bee population dynamics among intact wilderness areas. The presence of newly-arrived feral Africanized honey bee (AHB), Apis mellifera (Apidae), populations was studied for 10-17 years in areas previously with few or no escaped European apiary honey bees. Here I describe and interpret the major results from studies in three neotropical forests: French Guiana, Panama and Yucatan, Mexico (5° to 19° N. latitude). The exotic Africanized honey bees did not produce a negative effect on native bees, including species that were solitary or highly eusocial. Major differences over time were found in honey bee abundance on flowers near habitat experiencing the greatest degree of disturbance, compared to deep forest areas. 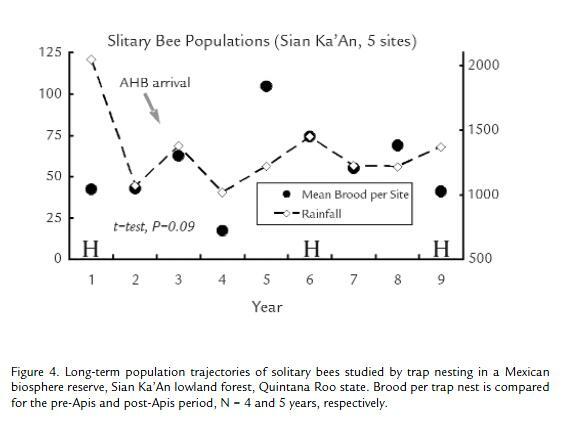 At the population level, sampled at nest blocks, or at flower patches, or at light traps, there was no sudden decline in bees after AHB arrival, and relatively steady or sinusoidal population dynamics. However, the native bees shifted their foraging time or floral species. A principal conclusion is that such competition is silent, in floristically rich habitats, because bees compensate behaviorally for competition. Other factors limit their populations. Pocos estudios han considerado la dinámica de poblaciones de abejas en bosques o hábitats no alterados por el hombre. La presencia de abejas silvestres Africanizadas de Apis mellifera (Apidae) fue estudiado por 10-17 años en áreas previamente sin esta especie. Aquí presento e interpreto resultados de tres bosques neotropicales: Guyana Francesa, Panamá y Yucatán, México (5° a 19° N. latitud). La abeja Africanizada exótica no produjo efecto negativo en las abejas nativas, incluyendo especies altamente sociales y solitarias. Diferencias mayores a través del tiempo fueron encontradas en la abundancia de las abejas de miel en flores cerca de hábitat con mayor grado de disturbio, comparado con el bosque espeso. Al nivel poblacional, muestreado en bloques de nidos trampa, en flores o con trampas ultravioletas de insectos, no hubo disminución pronta de abejas, y sí hubo una población relativamente estable o sinusoidal. Sin embargo, las abejas nativas cambiaron su hora de buscar provisiones o su selección de especies florales. Una conclusión principal es que esta competencia por los recursos es 'silenciosa', en las áreas florísticamente ricas estudiadas, porque las mismas abejas compensan con su comportamiento. Otros factores rigen sus poblaciones. Palabras clave: abejas solitarias, intracción interespecífica, estategias parasíticas, larva hospedada. — Leigh, Vermeij and Wikelski, 2008. It is admittedly awkward to summarize one's own work, when virtually nothing else is known of that particular topic. Such is the case here, with long-term studies of honey bees and their impact on other bees in America. This work was carried out in three Neotropical forests, for 17 years in each. Leigh et al., 2008, chose to write on 'what limits ecosystem evolution' and with terminology remarkably appropriate to the studies I will discuss here, put into words precisely the outcome of experimental studies with Africanized and European honey bees demonstrated in the Yucatan Peninsula (Villanueva and Roubik, 2004). We made a two-year (1989-91) experiment with the European honey bee, re-imported to Mexican apiaries to investigate the changes in its foraging choices compared to a period before the Africanized honey bees (AHB) arrived (data from 1985-86). The European honey bees, compared to Africanized honey bee colonies in the same apiaries, displayed a quantitative overlap in pollen species harvest of only 55%. They also are best regarded as distinct races of A. mellifera (Francoy et al., 2008). More important, the European honey bees chose to specialize, i.e., focus a major effort in forage collection, on considerably fewer species than the AHB. The European bees under direct competition for food with AHB were 33% more specialized, and their pollen use included 33% more species. We concluded the European bees were both more generalized and specialized than before the pressure of competition from a clearly more dominant (and abundant) honey bee was upon them. The total estimated pollen species used by A. mellifera included about 20% of the 860 local vascular plant flora. Curiously, one species of nectarless tree (Cecropia peltata) was the dominant pollen type used by both races of A. mellifera during experiments, whereas it was barely present in the pre-AHB period. I can now suggest that hurricane damage in 1988 (Whigham et al., 1991) caused the sudden increase in Cecropia habitat (light gaps), and likely led to the newfound 'specialty' of honey bees in Yucatan. A prediction from the Yucatan experiment (Villanueva and Roubik, 2004) was that native, solitary bees, like those studied on Barro Colorado Island, Panama (Roubik and Wolda, 2001) would also attempt to use more resource species and potentially change their specialization, when confronted with honey bees taking their food at flowers. It should be mentioned that Africanized honey bees seldom or never skirmish with or show any aggression toward other foragers on flowers (Roubik, pers. obs.). Similarly, regarding competition or other factors (Roubik, 1978; Roubik, 1980; Roubik, 1982; Roubik, 1983; Roubik, 1988; Roubik, 1989; Roubik, 1990; Roubik, 1991; Roubik, 1996a) it also must be made clear that counts of bees at flowers within a patch, whether on the ground or in the canopy of a tropical forest tree, are inconclusive regarding the populations in question. To establish whether or not populations decline, remain the same, or express another dynamic, it is necessary to take repeated samples, before and after an experimental variable is introduced (Box et al., 1978). Here, using the population sampling methods of light traps, or trap nests, or observation at highly sought and observable flowers, I compare three data sets of 17 years each, and summarize a major finding that can explain experimental results. That breakthrough was only possible due to application of pollen analysis to bee nest pollen stores which, despite the recognition of palynology as a discipline, is not included in discussions of what utility that discipline has (Erdtman, 1943). This overview provides such a statement. In mid 1976 I found that French Guiana, South America, (5°04' N, 052° W) was an excellent natural laboratory to study the impact of invasive honey bees. It had extensive and undisturbed forest and savanna (85% estimated intact; Tostain et al., 1992), and botanists such as R. Leisner and the late A. Gentry at the Missouri Botanical Garden were willing to identify my plant vouchers of bee forage. Bees were abundant and I recorded about 280 species, some 65 of them highly eusocial (Roubik 1990; Roubik, 1993). Moreover, the AHB was just beginning to colonize the area (Taylor and Williamson, 1975), and beekeeping with European honey bees was almost nonexistent. My methods in short-term experiments were to trap AHB swarms with empty hives, move them within the range of native bees foraging on flowers or honey baits, and record the outcome (Roubik, 1978; Roubik, 1980; Roubik, 1983). Another goal was to follow long-term bee abundance. To this end, I monitored flowering Mimosa pudica. It is a shrub in the Guianas, not a scandent herb as elsewhere, and presents its pollen (no nectar) at the end of the rainy season, when little other forage is available. Bees fill the flower patches in early morning. As I reported earlier (Roubik 1978; Roubik, 1996b) 11 areas with patches of M. pudica were watched, and all the bees on flowers were counted six to eight times each morning, for a number of years. This took place primarily near the port of Kourou, in 1977, 1981, 1982, 1989 and 1994. Also in 1989, a second patch surrounded by primary forest at Degrad Saramaka, 20 km farther inland than the Kourou port, was monitored, then again in 1994, along with the other patches, arrayed along the small road between the two endpoints. Four patches were added in 1994, along roads within 60 km of Kourou. Beginning in 1977 an Environmental Monitoring Program was set up on Barro Colorado Island (19°34' N, 088° W). This research preserve of 16 km2 (a hilltop isolated by the rising waters of the Panama canal) was used to sample insect populations with two ultraviolet fluorescent light traps. The traps were placed within older forest on the island, on a hillside. Equipped with baffles and funnels (Wolda and Roubik, 1986; Roubik and Wolda, 2000; Roubik and Wolda, 2001), one trap at 3 m and one trap at 27 m operated continuously (day and night) for 907 consecutive weeks (1977-1994). I counted and identified the roughly 40,000 bees that arrived in the traps. The Africanized honey bee arrived on Barro Colorado Island in June, 1984 and also subsequently arrived in the light traps. This represents many neotropical forests, because there is no beekeeping and there were never before feral honey bees. In tropical Mexico, during 1988-1991 and then from 2001-2005, solitary bees nesting in wooden trap nest blocks were systematically monitored for abundance and nest pollen identification in the 500,000 ha Biosphere Reserve of Sian Ka'An (19°34' N, 088° W). This extensive forest and wetlands reserve, in Quintana Roo state, is buffered by the Maya zone (Villanueva et al., 2005). We set out 300 drilled tunnels in each of four sites every two months, then retrieved traps and nests after two months for rearing. After bees emerged from tunnels, the nests were split apart and the pollen from each homogenized, acetolyzed and identified (Palacios at al., 1992; Villanueva and Roubik, 2004). The AHB first arrived in the region during late 1989 (op. cit.). As for tropical Mexico in general, no honey bees had previously colonized lowland areas such as this. The French Guiana data demonstrate gradual decline in native bee visitation to M. pudica (mostly Melipona favosa and M. fulva) in one of the more disturbed sites, the port of Kourou (Fig. 1). At the same time native bees dominated at the most forested sites (Fig. 2). 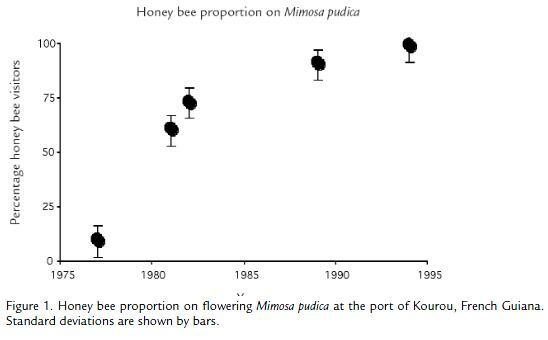 The number of bee visits (of any species) per flower at M. pudica declined in proportion with the dominance of Africanized honey bees (Roubik, 1996b). Barro Colorado Island had 41 bee species caught in the light traps, 14 relatively abundant, thus allowing further statistical evaluation (Roubik and Wolda, 2000; Roubik and Wolda, 2001). 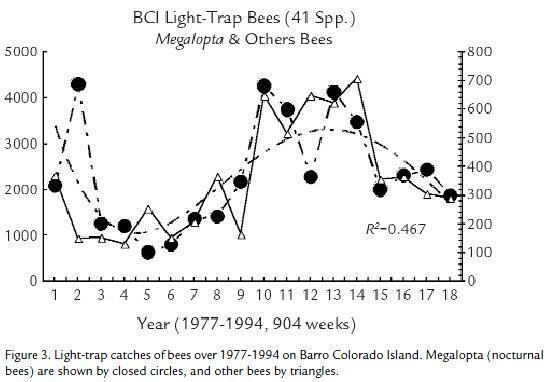 The total bee trap data presented here (Fig. 3); however, indicate a strong sinusoidal trend (R2 = 0.47) in the abundance of both the two nocturnal bees (Megalopta genalis and M. ecuadoria) and the remaining bees (mostly Meliponini but also some halictids and other species). The Africanized honey bee arrived near the middle of study period, on the eighth year of data collection, and the native bee populations showed no decline, until after a subsequent six-year increase. The highest recorded numbers of AHB at the light traps occurred during that interval, in agreement with dynamics of the native bees (Roubik and Wolda, 2001). As discussed (op. cit.) there were no consistent reciprocal relationships between the abundance of honey bees in a year and the abundance of any of the 14 native species. The AHB arrived in Yucatan at the end of the 1980s, which was also a time of hurricane devastation in the eastern portion of Quintana Roo. More hurricanes occurred in 2002 and 2005, indicated in Fig. 4 The AHB was presumably increasing in abundance during the first four years of the study, until 1991, and beyond. At the second study interval, beginning in 2001, it may have 'saturated' the environment. Comparing the two intervals, no decline in solitary bees was encountered in the nesting blocks (megachilids and one Centris, t-test, p = 0.09). Pollen identification involved nearly 400,000 grains for the solitary bees and also for the honey bees (Villanueva and Roubik, 2004). For the solitary bees, we found that most of the study species, in an individual nest, took one to three pollen species. A total of 72 important pollen species were used by Centris, and 28 by the megachilids. Pollen used in the pre-Apis and post-Apis years comprised from 24 to 19 and 11 to 12 plant families, respectively, and a total of 87% and then 79% of Centris nests contained one or two major pollen species, respectively (72 species, total). The megachilid females used primarily one species in both periods (28 species, total), first in 41% and then in 66% of nests. Diversity in major pollen resources (Chao and Shannon indices), computed on a yearly basis, revealed negligible change, while two important plant families greatly diminished in representation after the Africanized honey bee presence (Roubik and Villanueva-G, unpublished). The variation in tropical bee populations experienced annually within forest, for euglossines and for Centris (Roubik, 2001), indicates that variation tends to maintain stable trajectories, even though populations halved or doubled within one year. The general theory for bee populations, compared to their floral resources, is that the two should not be closely connected, except of course by season. Adult bees emerge long after the flowers that produced them were available, and resources such as flowers or nest sites have no immediate connection to the numbers of adult bees in the environment. And therefore, there should be 'loose niches', or species interactions that wax or wane based on seasonal and annual fluctuations in populations, rather than a steady state. In this view (Roubik, 1992; Roubik et al., 2003), bee species and plant species frequently change mutualistic relationships, plant genera and bee genera as well (but less frequently), and so on. The outcome, in addition to lose niches, may be openness to colonization by exotic flower visitors. With three intact and large, forested Neotropical areas now studied for 17 years, the result of AHB colonization from 10 to 17 years includes competitive displacement at flowers, but no such process occurring in surrounding habitats. The detailed statistical analyses of time-series trends in colony experiments with stingless bees and their brood and stored food was in agreement (Roubik, 1983). The impact of several introduced colonies was not detectable. However, the introduction of more colonies, and the use of more sensitive measurements, like quantifying the number of incoming foragers and identifying pollen grains, did detect an impact (Roubik et al., 1986). That study revealed that characteristic, occasionally intense resource harvests were eliminated by competing honey bees. A prediction was made, that the observed amount of forage reduction would produce a population decline if it continued for 10 years. That this did not occur, in the populations of bees sampled on Barro Colorado Island for 10 years after AHB arrival, probably means that the model was wrong, or that the data were not representative (see Roubik and Wolda, 2001), or both. Again, we are left to contemplate why an 'invasive' or any other bee can take the food from a variety of plant species also used by other bees, for example Bombacaceae and Anacardiaceae (Roubik 1989; Villanueva and Roubik, 2004), and not affect the competing populations. I believe the answer is that it does affect their populations but, at the population dynamics level, such competition is silent. The adjustment is made rapidly by behavior and flower choice. To the IV Encuentro Colombiano Sobre Abejas Silvestres.